Drumming | When Am I Supposed to Start Feeling Like a Grown-Up? So, I’m on a bit of a roll with the stuff-I’m-rubbish-at theme. Last week I talked about having no sense of direction, and this week, it’s all about coordination. Yesterday, I found myself at a drumming workshop. As you do. That’s me with the red hair and Ruth two places to my left. The teacher was a tiny woman called Ruth, and though she looked like she might be blown over if someone sighed a bit too loudly, she radiated an extraordinary energy. We were a motley group of drumming novices, and yet she was able to communicate, with absolute clarity, when we should stop, start, get louder or softer, copy her rhythm, or just bash the drums like maniacs. She used her entire body to do this and it was extraordinary to watch. At the end of the session, Ruth bid us put our drums down because we were going to do a clapping exercise. To a beat, we alternatively had to clap our hands together, then clap the hand of the person to the right. ‘Don’t go too fast’ she warned, ‘or you’ll get confused’. What do you mean we’ll get confused? I thought to myself. This is easy – I can handle it no problem. I’ve got Grade 8 distinction on the viola for goodness sake – I can manage to clap my own hand then clap someone else’s. Then, still singing, Ruth took one of those rattly percussion eggs out of a bag. Instead of clapping her neighbour’s hand, she put the egg in it. On the next beat she passed another egg, and then another, and these eggs started to be passed round the circle to the beat. Despite the fact that I’d been watching this whole process and understood what was happening, when the first egg was put in my hand, my brain went ‘Oh my god what’s that?’ and I dropped it. On the next beat, another egg arrived in my hand. This one surprised me exactly as much as the first one had and I dropped that one, too. And it worked for the next beat – I managed to keep hold of the egg and pass it on. But the next egg gave me another shock and I dropped it… and the next. Soon there were rattly eggs all around my feet. I stopped trying to sing, clap or pass eggs and just started to laugh – properly and uncontrollably. The tears-down-your-cheeks kind of laughing. Throughout the workshop I’d watched Ruth use her body – to communicate, instruct, dance and make music – all with an apparently effortless grace. I walked out of the room, feeling a complex range of emotions – I was glowing with the cathartic experience of laughing till I cried, chilled out from the drumming, and slightly mournful that I couldn’t experience the joy of moving like that so naturally. I’m not sure why any of this came as a surprise to me. I’ve always had problems with co-ordination. Had I been born in this century, I’m pretty sure I would have been diagnosed as dyspraxic, but in the 1970s and 80s, the difficulties I had with sport, dancing, writing, organising myself and finding my way about (see last week’s blog – Getting Lost in My Own House – Life With No Sense of Direction) meant I was called all sorts of other things – none of them particularly scientific sounding. During the rattly egg incident, I was vaguely aware that I’d had this precise sensation once before – that of helpless laughter in the face of a total failure of co-ordination that didn’t really matter. It was sports day 1981. The three-legged race. Zoe Passfield and I were a team. We’d practised faithfully in the playground for many days. We were poised at the start line, raring to go. When the whistle blew, we ran two steps, collapsed in a heap, and spent the rest of the race prostrate on the field, giggling hysterically and making no attempt to get up. I’ve always remembered that moment for its strange sensation of real joy in the face of absolute defeat. It was good to experience it again. 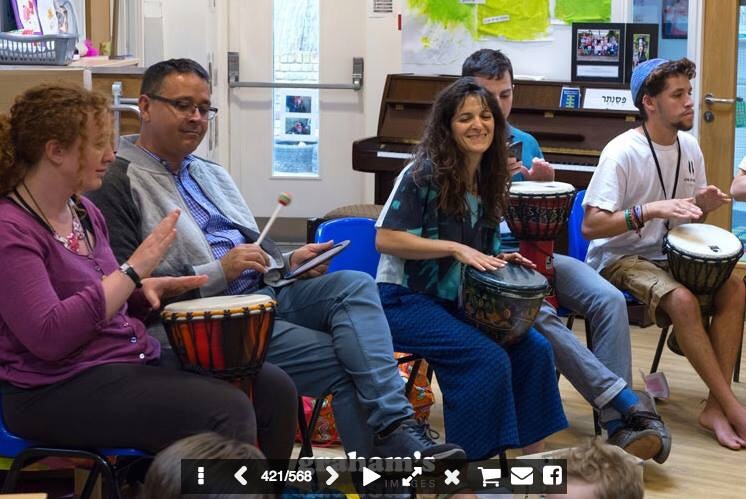 This entry was posted in Dance, Drumming, Dyspraxia and tagged choirs, co-ordination, dance, drumming, drums, Dyspraxia, humour, Judaism, laughing, MRJ Choirs Festival, music, Od yavo shalom aleinu, peace, percussion, Reform Judaism, Ruth Cohen-Rose, Shirei Chagigah, singing, sports day, three-legged race on July 13, 2015 by feellikeagrownup.